Get superior image quality and enhanced productivity from the WorkForce GT-1500 color document imaging scanner. This easy-to-use scanner offers the versatility you need to electronically archive important documents or share records with your workgroup. And, with 1200 x 2400 dpi resolution, it delivers truly amazing quality, so you can capture every detail all with easy, one-touch scanning. This powerful performer makes it easy to scan stacks of records, applications and forms. Use the high-capacity automatic document feeder to quickly scan a variety of sizes up to 8.5 x 14. The WorkForce GT-1500 speeds through scans up to 20 pages per minute, giving you more time to tackle other tasks. And, it not only offers greater productivity, it ensures more efficient operation. With innovative ReadyScan LED technology, there is no warm up time required. Best of all, this earth-friendly LED technology does not include any mercury, and it reduces power consumption. The smart choice for all your document imaging needs, the WorkForce GT-1500 includes a powerful software package. ABBYY FineReader Sprint Plus OCR allows you to create editable text from scans, while ScanSoft PaperPort makes it easy to organize all your documents. 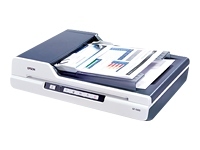 Use Epson Scan to create multi-page PDFs, or to copy or send scans as e-mail attachments. It is all right at your fingertips with the WorkForce GT-1500, a powerful performer available at an amazing value.